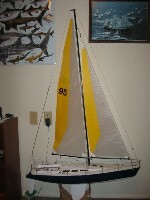 I constructed and painted this beautiful sailing boat in Spring 2005. 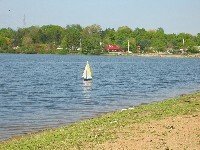 Since then, I have sailed it numerous times at various lakes in Ohio. 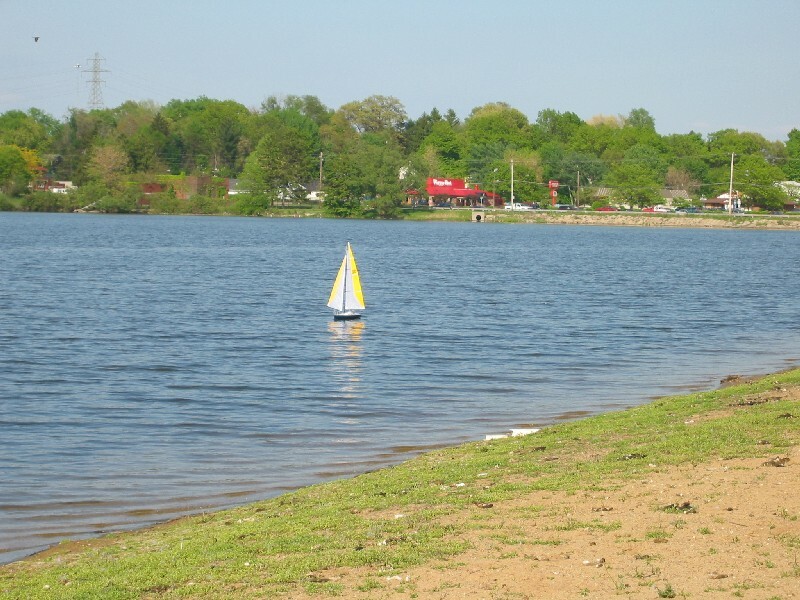 Though I usually sail in Lake Nesmith, the lake just in front of my home, I have also sailed in other large including Portage Lakes and Lake Erie. 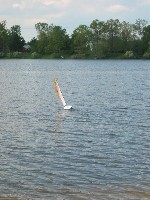 This model by Graupner is fairly easy to build, the main challenge is painting the model. It took me nearly one month to complete the paint job since I worked wit a total of 7 layers of paint and two colors. I used Monocote brand paints and have achieved a glossy look. This paint is totally waterproof and has not shown any wear at all. I also wax the book once every few months. 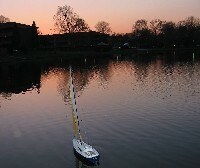 I am using a Graupner C16 receiver at 40mhz and have achieved a range of at least 1km on the Graupner FM 314 radio. 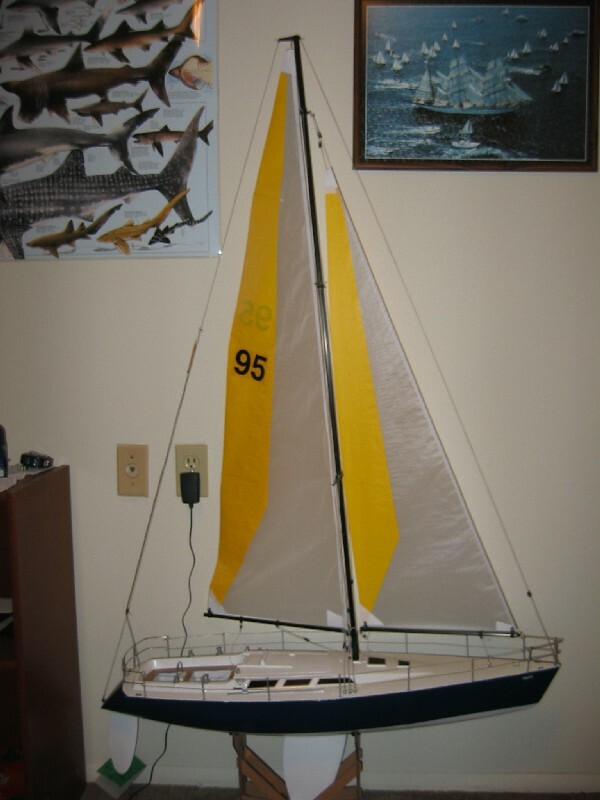 I used the HS-785HB Sailwinch Servo on this boat and its power is enough to collect the sails even in high winds. 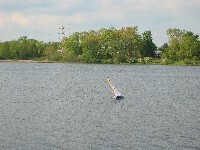 I used a standard large size servo for rudder control. 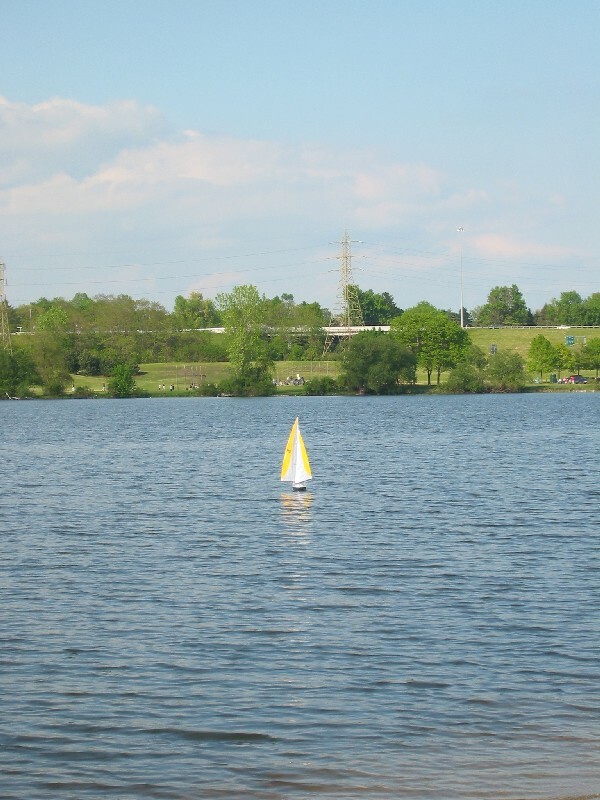 The boat is very seaworthy and I have sailed in 20mph winds in Lake Erie. 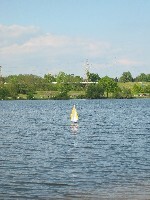 There are two service hatches on the both. One of them is a sliding hatch and the other is a service hatch in the cockpit area which is screwed into place. During high wind, when the boat bends a lot to the side, water gets into the cockpit area and lowly penetrates the service hatch in this area. 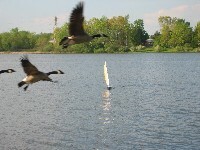 It is therefore important to properly seal this are using durable rubber gaskets. As a secondary precaution, it is a good idea to place the receiver in a waterproof plastic bag before gluing it on the board with the servos. This should protect the valuable electronics. 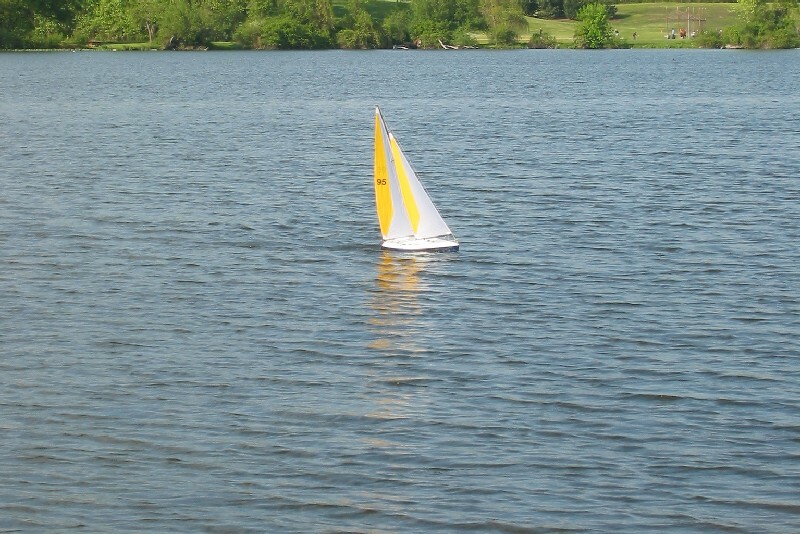 Sailing is really a relaxing hobby. It is also very exciting in high winds, but only after sufficient experience in calm breezes. 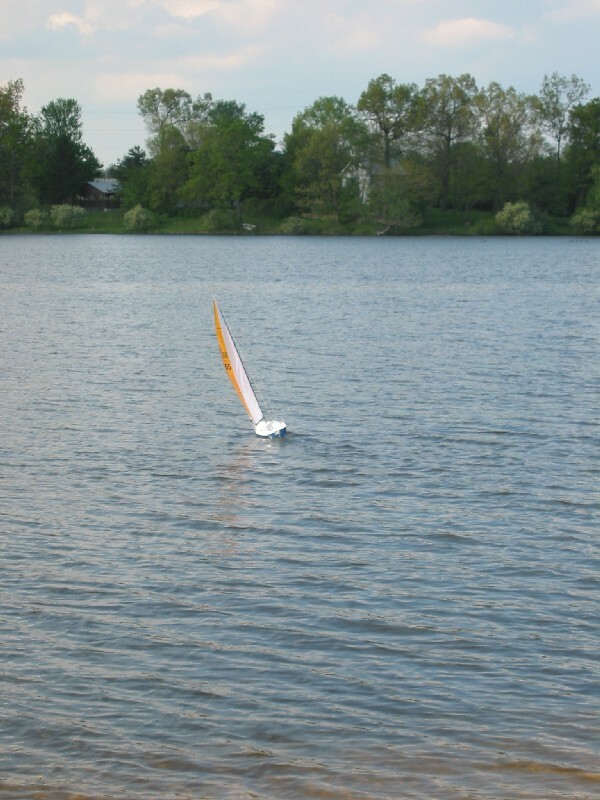 Below are some pictures of my Saphir sailboat. I hope you will enjoy them and perhaps also get into the hobby yourself someday.